Attended morning service in the lecture room. Mr. Morse read; as usual. Mary and I sat with Mrs. Peter Pierce. She is quite a hopeful in regard to Thomas. They received a letter from him a few days since in which he says he is getting along nicely and will come home as soon as he can get a furlough as the surgeons says he may not be able to be on duty for three months, and may perhaps have a stiff knee. The poor fellow must have suffered much though he does not complain, simply gives a statement of facts. He was wounded at the battle of Murfreesboro on the 31st of December and crawled off the field unassisted. _____ shortly after found him and carried him to a hospital tent but it was so crowded that he could not gain admission, so Tom had to lie on a little straw outside for 24 hours. His regiment was ordered away and he was left among entire strangers. The next day he was taken inside the tent, and on the third day the surgeon dressed his wound. Yesterday Mr. Pierce received a telegram from George saying, Tom at the Hurricane Hospital, shall I send him home? Mr. Pierce replied in the affirmative, so they think he may be here this week. The Battle of Stones River (Murfreesboro) was fought December 31, 1862 thru January 2, 1863. Almost a month later, civilians in Michigan were receiving accurate information about a wounded family member or friend and a telegram asking if their soldier should be sent home. Telegrams. The telegraph wires transmitted messages in Morse Code across the country. This form of communication tended to be more reliable in the North, but telegrams were definitely used in the South too. A common civilian family typically received a telegram with extremely sad, happy, or time-sensitive news. Miss Richmond records that the Pierce family received a telegram regarding their son’s arrival home; that was a message that could’ve taken a while to travel by mail, and the sooner the soldier got home, the better. 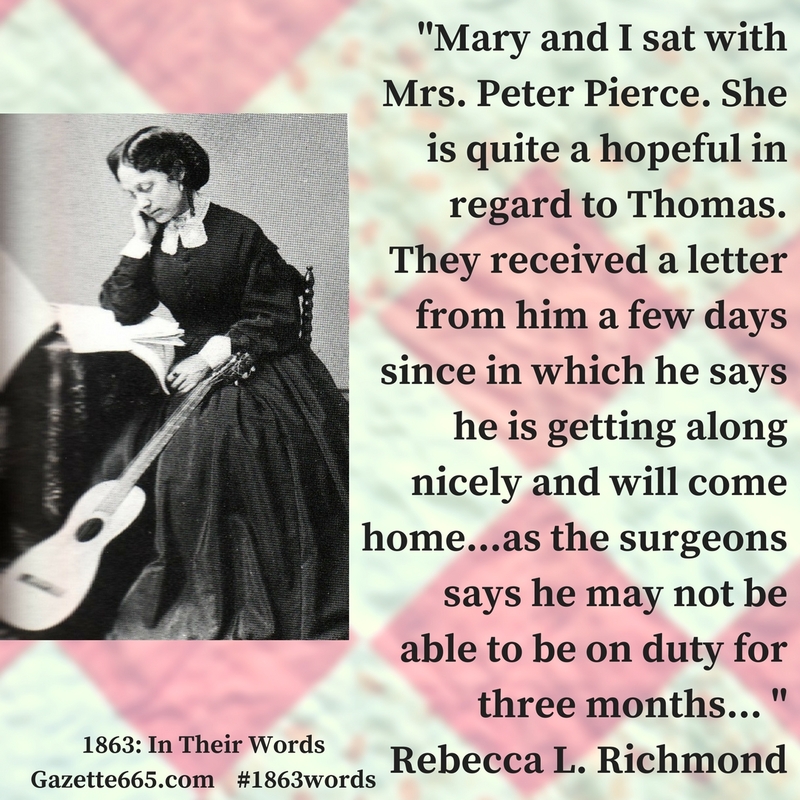 Miss Richmond reports the plain facts as she heard them in this journal entry, without additional comment, making it difficult to know in this case what she thought about the medical care Tom Pierce received. In other cases, though, the homefront was skeptical of the medical care or thought the surgeons delayed getting to their wounded soldier. However, many surgeons – on both sides – worked to exhaustion after large battles, trying to tend the wounded as quickly as possible. From the details Miss Richmond recorded about Tom’s wound, it’s probable it wasn’t very serious. She mentions no talk of amputation (no shattered bones) and says he may have a stiff knee. Likely, it was a flesh wound which would have put him far down on the list of soldiers needing medical attention or an operation in the battlefield triage method. 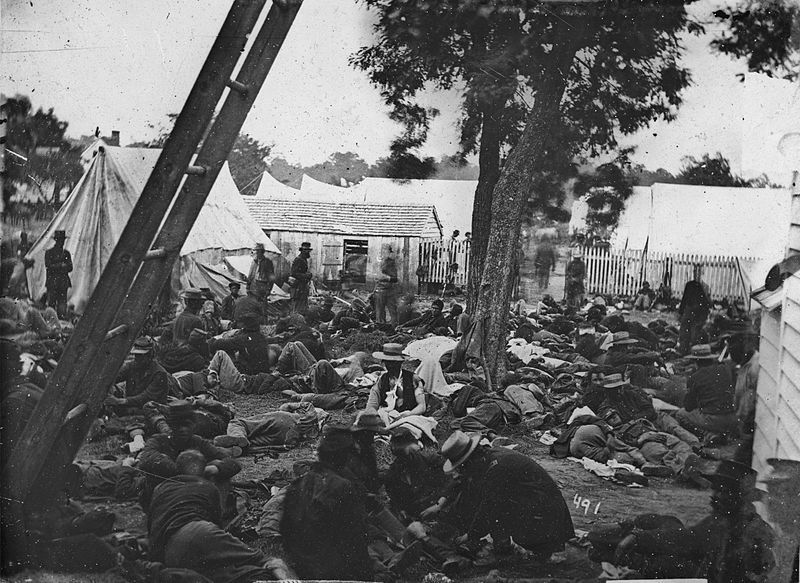 With a less severe wound, a soldier would have spent hours waiting for aid in a crowded field hospital. The observation that this soldier was among strangers implies uncertainty, but in some ways it was better that the medical staff was “unknown.” Particularly at the beginning of the war, regimental surgeons were often the town doctors or a local medical student; while that might initially seem like a comforting idea, the trauma on these medical personnel was severe. They were treating the boys they had watched grow up or their friends, fighting a battle for life that was lost too many times. When I first found Miss Richmond’s journal entries, I thought there was some possibility for a homefront perspective blog post, and as I researched farther I found an exciting surprise and long-distance connection to a famous Civil War figure. 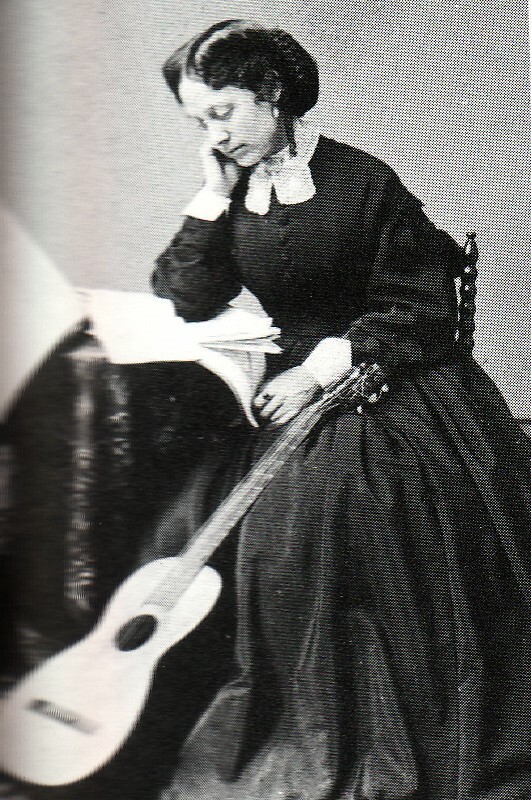 Rebecca Loraine Richmond lived in Michigan and spent the war years worrying about her brother in the army, sewing and fundraising with the local Ladies’ Aid Society, playing guitar, entertaining her family’s company, and filling nine volumes with journal entries. She also made several trips east during the war to visit her cousin – Elizabeth Bacon – who married the Union cavalry commander, George A. Custer.